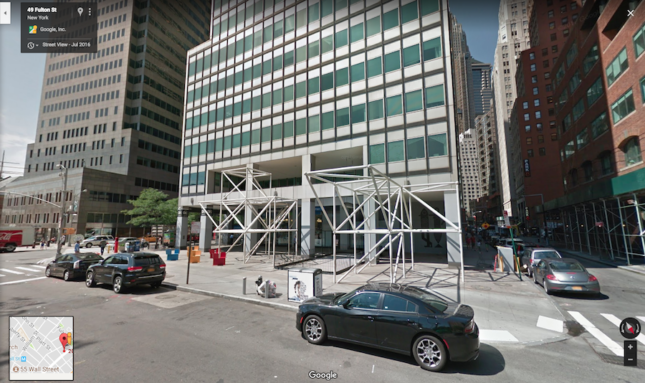 In lower Manhattan, a prominent developer wants to convert a public space into private retail, and the city is at least a week away from a vote that could allow the project to move forward. Rockrose Development’s bid to completely enclose and privatize the arcade at 200 Water Street comes just months after the city permitted the destruction of the landmarked Sasaki fountain at the Citicorp Center, and is yet another example of a public outdoor space the city could cede to a commercial interest. In June 2016, the City Council approved a zoning change that opened up these spaces to commercial development. The Water Street Upgrades Text Amendment allows existing arcades to be infilled for retail and encourages “improvement” of existing plazas. In total, the new rules place more than 167,000 square feet of the POPS up for redevelopment. From a design perspective, it would be hard to top the space’s first incarnation, which was cool enough to land on the cover of Progressive Architecture (PDF) one year after opening. Designer Pamela Waters used roofing gravel to craft a cheerful cat chasing a bird on opposite sides of the seventh floor setback, an almost wraparound terrace. Viewed from above, it’s clear that the terrace’s gap permanently prevents the cat from catching its prey (though there’s another wire mesh bird that covered the window-washing rig). On the roof, mechanical equipment was painted kindergarten colors and decked out in lights to illustrate water and air flowing through the HVAC system. 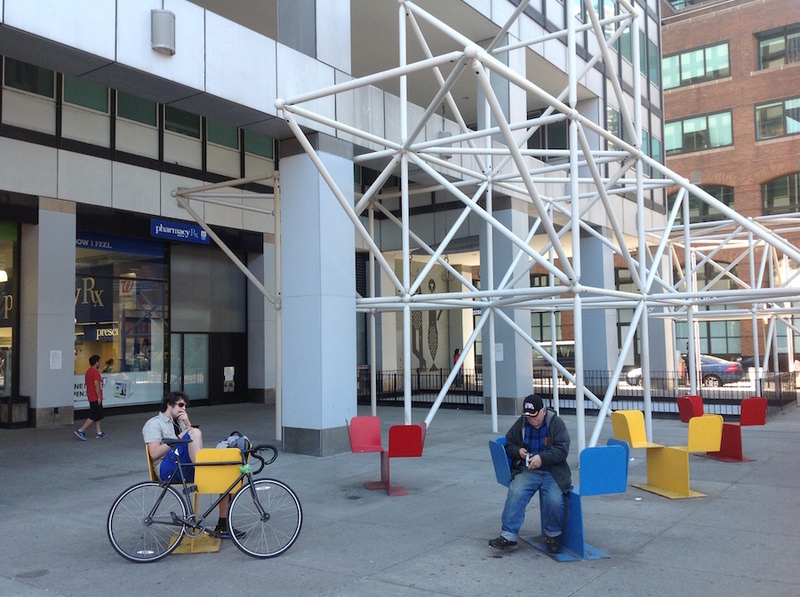 On the plaza level, metal benches in the same colors sat beneath Op Art murals that zigzagged through custom scaffolds all the way up to the edge of the sidewalk. Visitors could ascend the scaffolding to access seating on above the street. 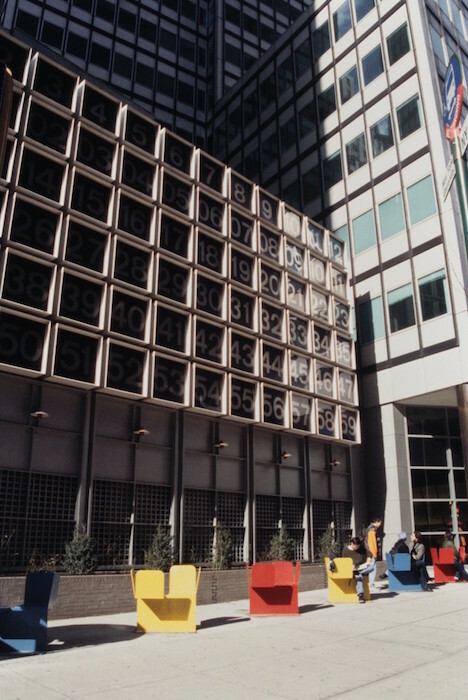 Around the corner at John and Water streets, Kaufman pasted mirrored walls onto two buildings that couldn’t move for the 32-story tower’s construction, while an inset digital clock on the Water Street side of the old building mimics the grid of the new tower. Melvyn Kaufman even installed a wax likeness of himself on one of the benches (it was removed after some unspecified “hostile reactions”). The arcade’s whimsy, capped off by a water feature and a neon-banded purple-and-blue light tunnel to the inside, was meant to enliven a long walk from the main entrance on Fulton Street to the building’s elevator bank. Rockrose maintains that the Fulton Street arcade is beyond rehabilitation, and proposes restaurants and retail as a way to enliven the front of the structure, which it converted to rental apartments in 1996. As soon as the end of this month, the City Planning Commission could hear Rockrose’s application to infill three of the building’s POPS, totaling more than 4,700 square feet, per rules outlined in last year’s zoning text amendment. 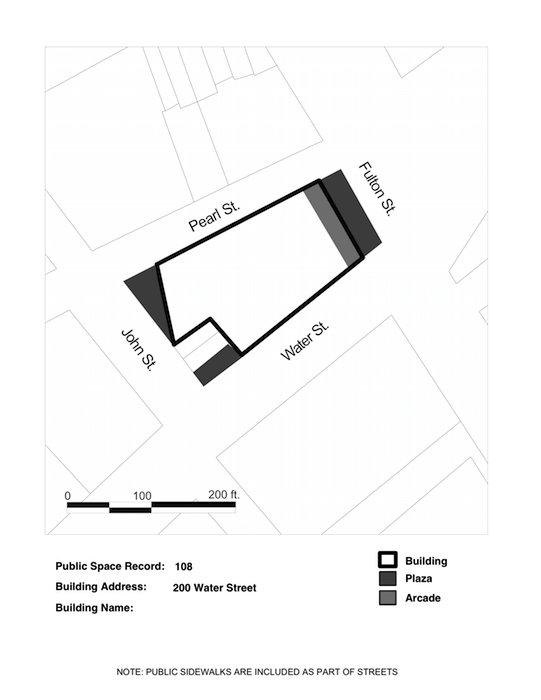 The developer would like to add almost 1,800 square feet of new residential space in the double-height arcade facing Fulton, and on the ground floor, the plaza would lose about 3,000 square feet of public space. New York–based MdeAS is working with the developer to design the new spaces. 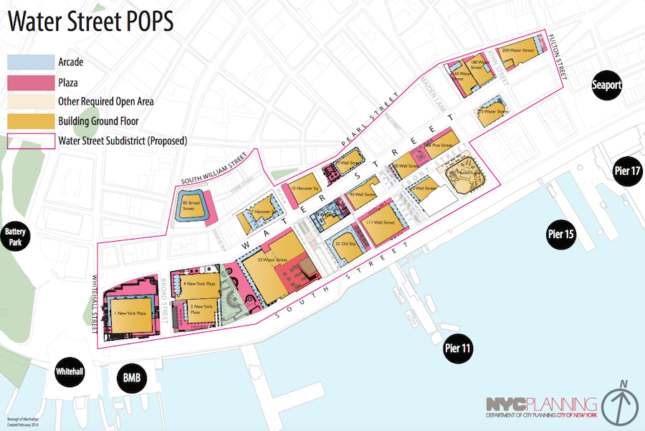 CB 1 maintains that building into the arcade could interrupt the flow of connected spaces that distinguish the Water Street POPS and its buildings from the rest of the neighborhood. Though the city contends that the plazas are underused relics from bad midcentury planning, lower Manhattan is in the midst of a development boom that’s slated to bring more foot traffic at all hours to the traditionally 9-to-5 neighborhood. The intersection of Fulton and Water streets is a heavily-trafficked corner, the gateway to the South Street Seaport. Likewise, the South Street Seaport’s restaurant and tourist revival, including a new mall at Pier 17 and ferry service from nearby Pier 11, herald an increase in pedestrian traffic at Fulton and Water streets at what is already a busy intersection. According to CB1, Rockrose hasn’t submitted a pedestrian traffic study on the impact of enclosing almost 4,000 square feet of space at this corner. Multiple nonprofit urban advocacy groups have weighed in on Rockrose’s proposal. In an open letter, the City Club of New York suggested Rockrose’s “lack of enthusiasm” for maintaining the POPS was an aegis for redevelopment-by-neglect. “In this case, converting half the space of the POPS to rental floor area and reducing the area maintained for the public by half is clearly a win-win for the owner,” it said. There may be other options for reuse, though, that preserve the public space. In a letter to Marisa Lago, chair of the City Planning Commission, the group Friends of Privately Owned Public Spaces suggested three ways that Water Street Arcades could be creatively repurposed without reducing the total amount of public space. The owner could glass in an arcade to make a public interior and collaborate with a public entity like the New York Public Library for programming, or create a POPS with a food service component a la Lincoln Center’s David Rubinstein Atrium. As a last option, the owner could cede space to a city-run concession (like the ones operated by NYC Parks) whose proceeds would fund improvements to other POPS in the area. At the earliest, the City Planning Commission could review the application on October 30, although no public testimony will be heard at that meeting. To comment on Rockrose’s proposal, members of the public may email the commission at centralintake@planning.nyc.gov with the subject line “Application N 170284 ZAM 200 Water Street Arcade Enclosure.” The commission’s website is updated regularly, so readers should check back there for the latest hearing schedule. Editor’s Note: Last year, The Architect’s Newspaper sponsored a design charrette for the Water Street POPS to envision how they could become the vibrant gathering spots and successful corridors they once were. In May 2016, AN Managing Editor Olivia Martin also provided testimony opposing the Water Street Upgrades Text Amendment at a meeting of the Subcommittee on Zoning and Franchises. Martin had no role in reporting, fact-checking, or editing this story.